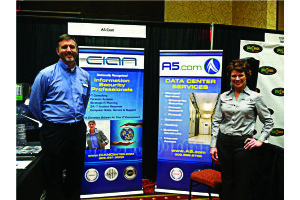 A5.com participated in the McLean County Chamber of Commerce “Twin Cities Showcase” on Friday, May 3, 2013. The showcase was held at the Marriott Hotel & Conference Center in Normal, IL. Over 75 local businesses, including tastings from a few local restaurants, showed off their products and services. A5.com’s Eric Fisher, Director of Data Center Operations, and Christine Bare, Business Development Coordinator, were able to showcase photos and details of the newest A5.com Tier III data center in Bloomington, IL and address questions on our service offerings. Ed Rust, Chairman and CEO of State Farm Insurance, was the speaker for the Keynote presentation. It was a great opportunity to support the McLean County Chamber of Commerce and other local businesses within the community.